Learn and practice proven multiple choice strategies for paragraph comprehension, English grammar, word problems and Basic Math! If you are preparing for the COMPASS, you probably want all the help you can get! 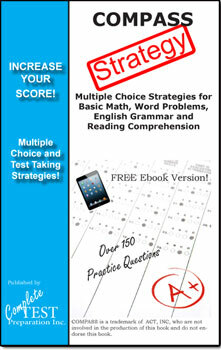 COMPASS Test Strategy is your complete guide to answering multiple choice questions! Powerful multiple choice strategies with practice questions – Learn 15 powerful multiple choice strategies and then practice. Answer key for all practice questions with extensive commentary including tips, short-cuts and strategies. Includes over 150 practice questions! Once you learn our powerful multiple choice strategy techniques, practice them right away on paragraph comprehension, basic math and arithmetic reasoning! Order PDF Download – Download after purchase – no waiting – no shipping!